Welcome to Little Creek Falls, a beautiful place to get away from the stress of everyday life and enjoy the serenity of nature. Little Creek Falls is located just two miles away from Smoky Mountain National Park. Imagine all the hiking, fishing, and exploring that could be done while remaining close to your cabin. Our cabins come in one through four-bedroom sizes to accommodate groups and families of all sizes. Amenities range from large wrap around decks to outdoor hot tubs and indoor jacuzzies. With such a proximity to Smoky Mountain there isn’t much more you could ask for in a vacation rental property. Whether you spend the day hiking through the mountains, exploring the breathtaking waterfalls, or taking a dip in the fresh water, adventure is never hard to find at Little Creek Falls. If shopping and museums are more your style head into either Gatlinburg or Pigeon Forge and enjoy a variety of famous museums and unique boutique shopping. If you want to experience something truly special head down anytime of the year to the Indoor Rainforest Adventures Discovery Zoo. Boasting exciting creatures such as frogs and reptiles from around the world the Rainforest is sure to be an experience you won’t soon forget. SmokyMountainsByOwners.com is a one stop shop for all your Smoky Mountain adventures. 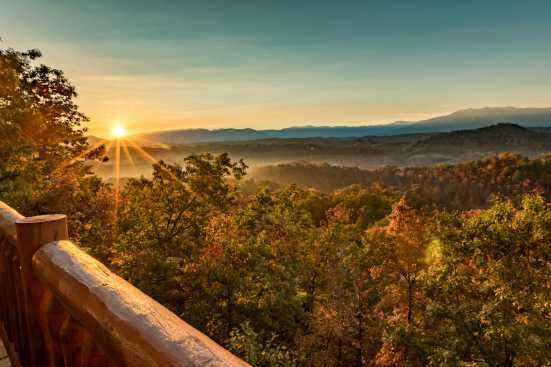 Whether you are relaxing and taking in the majestic views from your cabin or you venture into the beautiful Smoky Mountain National Park there is something for everyone to enjoy.